Recover deleted or lost photos, videos and audios. 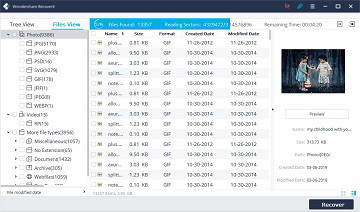 Restore 10 media files for free without file size limits. Require no payment if your files can't be recovered. Recoverit Photo Recovery empowers you to restore images, movies and music from all storage media. Do deleted photos and videos recovery from computer hard drive, digital cameras, Drone cameras, Android phones, memory cards, etc. All pictures and videos shot by digital cameras are riddled with every precious moment in our lives. 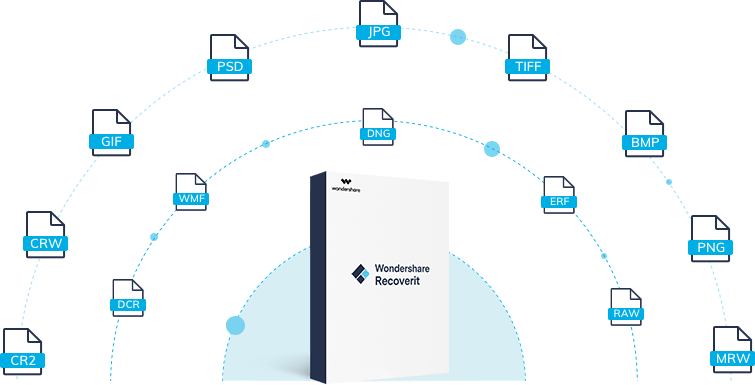 Recoverit Photo Recovery helps you keep the lost files recovered and well protected. The camera photo recovery software supports photo and video recovery from digital cameras in different brands, including Canon, Nikon, Fuji, Sony, Panasonic, Pentax, etc. It recovers deleted photos and videos from such Drone cameras and instant cameras with SD card as DJI Drone, GoPro Drone, Fuji Instax Square, Polaroid cameras, etc. SD cards have been universal in many electronic devices like cameras and Android phones. Recoverit Photo Recovery allows you to get back deleted media files effectively and efficiently. The SD card recovery software specializes in restoring deleted photos and videos from memory card in all types, including Micro SD card, SD Card, CF card, MMC, SmartMedia, xD-Picture card, etc. 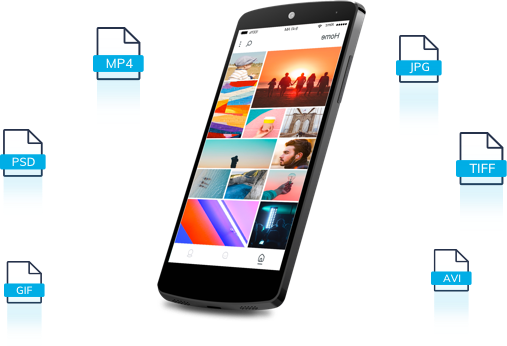 Android photo recovery can be done without any hassle here, regardless of the brands and models of your Android phone, like SamSung, BlackBerry, Nokia, Windows phone, HTC, Motorola, Nexus, etc. Recoverit Photo Recovery is able to restore image files, photoshop files, video files and audio files from computer hard drive and connected external devices. The photo and video recovery software can work well with both Windows and Mac computer. 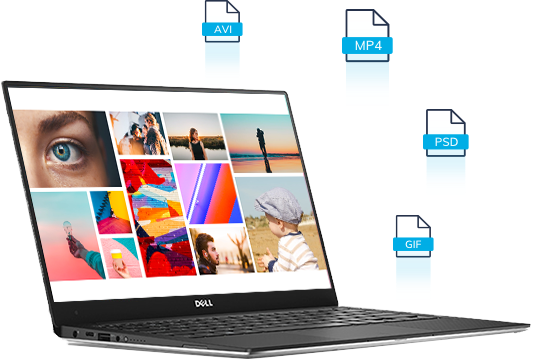 It can get back the photos, videos and audios you deleted from a wide range of file systems, including FAT, FAT32 file system, NTFS, ReFS, HFS, HFSPlus, APFS, RAW file system, etc. 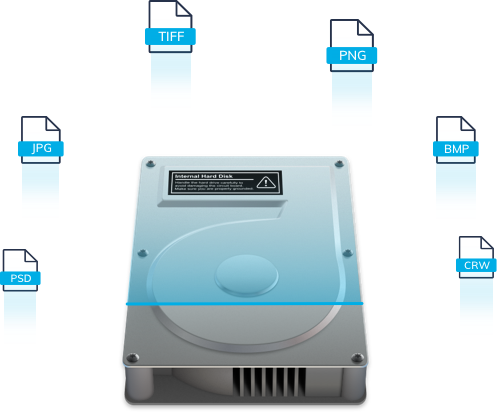 The deleted files recovery can be done no matter where they were located on computer before, such as computer hard drive disk, emptied recycle bin or trash, solid state drive (SSD) and so on. Recoverit Photo Recovery is a versatile external hard drive recovery tool for your deleted, lost or formatted photos, videos audios and other media files. 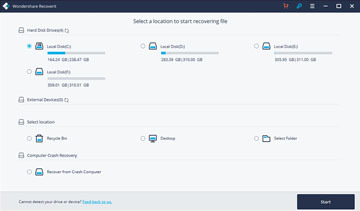 The disk photo recovery software makes photo and video recovery much easier and securer from all sorts of external hard drives, SSDs, USB flash drives, and pen drives. It supports digital images, movies and songs recovery from external hard drive in different brands like SanDisk, LeCia, Transcend, WD, Seagate, Toshiba and so on. External hard drive is not detected, unallocated, damaged, crashed or formatted? Recoverit retrieves your lost photos, videos and audios within minutes and without harms. Lost meida files? Take it easy! Recoverit Photo Recovery helps you with photo, video and audio recovery no matter how you lost them. 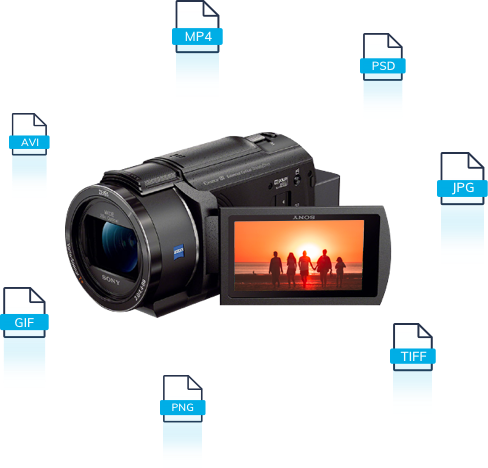 It is comprehensive and professional beyond your expectations in all situations for recovering lost pictures, videos and audios . "Oops, I accidentally deleted my photos." If you also meet the dilemma and wonder how to recover deleted photos, all you need is a deleted photo and video recovery app like Recoverit Photo Recovery. It enables you to recover recently or permanently deleted photos, videos and audios from computer and emptied recycle bin. Formatting the storage makes for fixing many issues, but also causes lost photos and videos. Or you might just format the hard drive, USB flash drive or SD Card by mistake. Free download the photo/video restore app to do the format photo recovery and format video recovery in no time. Nothing can be more desperate than computer system crash, as it easily causes the loss of important files like pictures, videos and audios. Luckily, you still stand the chance of crash recovery, without professional knowledge required. Recoverit automatically scans, finds and recovers photos and videos of your choice. Files can be easily infected, damaged, encrypted and even erased by virus and malware. Anti-virus programs can sometimes get the issues fixed. If not, Recoverit Photo Recovery can recover images, videos, movies, audios and music with a 96% recovery rate while remaining the data intact and safe. The partitions of a hard drive and SD card can be lost due to such many factors as mishandling. With advanced scan algorithm detecting all hard drive disks, Recoverit Photo Recovery can piece all data together and recover photos, videos and audios on the deleted, lost, resized, formatted or hidden partition. Recoverit Photo Recovery is an all-around photo and video recovery app that supports different data loss situations, including emptied recycle bin, external hard drive not detected, system restallation, damaged or corrupted hard drives and SD cards, wiped hard drive, inaccessible hard disk, and many more. You're able to perform the pic and video recovery within 3 steps and minutes. No tech knowledge is required. 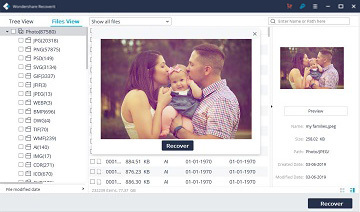 Recoverit Photo Recovery features intuitive interface and straightforward process to undelete photos and videos. Get to know how to recover deleted photos, videos and audios here. Have Recoverit run and select the location where you lost files. Let Recoverit scan the specific drive for your photos, videos and audios. Preview the scanned files and click "Recover" to retrieve media files. 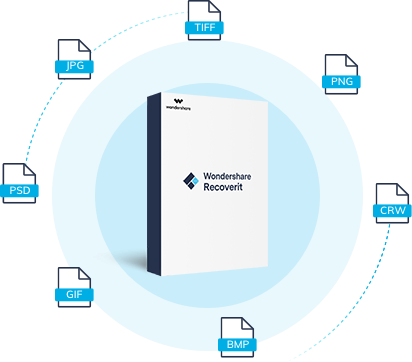 Recoverit Photo Recovery can deep scan all Windows or Mac hard drives as well as the connected removable photos and videos storage mdeia. As a powerful files recovery software, Recoverit Photo Recovery supports retrieve all popular formats of media files like photos, videos, and audios.